Mixing with your computer keyboard and mouse can be like tying your shoes with chopsticks. That's why we designed the Mackie Control Universal to deliver full hands-on control over popular audio and video software applications including Logic Pro 7, Logic Express 7, Final Cut Pro 5, Soundtrack Pro, Pro Tools, Cubase, Nuendo, Sonar, Tracktion, Digital Performer, Vegas, Audition and more... all right from your desktop. Unlike other control surfaces, Mackie Control Universal goes far beyond simple faders and transport controls. In fact, thanks to proprietary hardware and software protocols pioneered by Mackie, MCU gives you the most comprehensive feature set on the market. 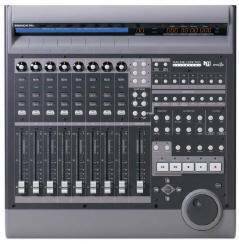 With nine 100mm Penny+ Giles optical touch-faders, a full-sized backlit LCD, V-Pots for fast tweaking of parameters and plug-ins, a full implementation of Logic Control – as well as shortcut navigation and editing for major audio and video software – MCU is the first and last desktop control surface you will ever need.